Are you in looking for an affordable cheese slicer that would cost you less than $20? Then, you've come to the right place because we'll be reviewing five products to find the best cheese slicer in the market now. All products will be reviewed based on their features, performance, and convenience. 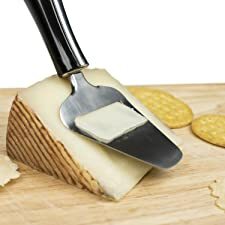 Although, some people like to use regular knives in cutting cheese, most people like to use a cheese slicer for better convenience. Compared to a typical knife, a cheese slicer allows you to control the thickness of your cheese. Cheese planes are pulled across the flat surface to scrape off very tiny slices of soft cheeses. The blade is embedded in the metal surface base. 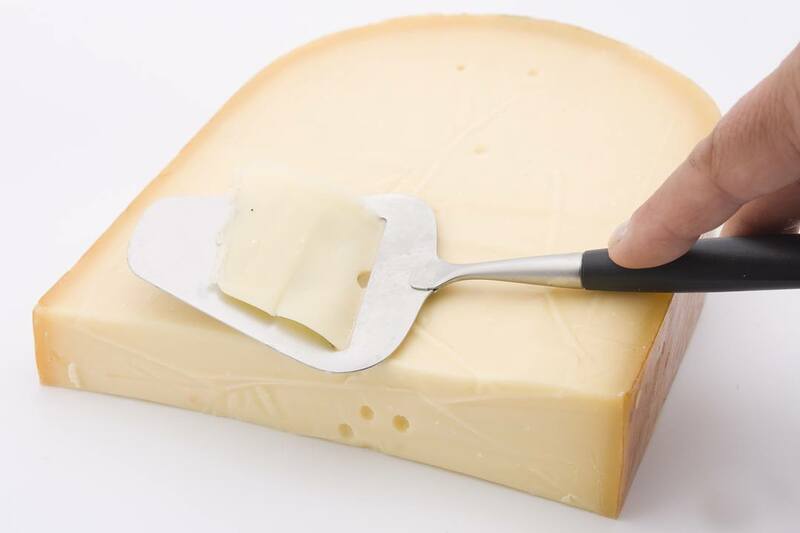 A hole is designed just right above the blade to let the slices of cheese pass through easily. This type of cheese slicer is suitable for semi-soft and hard cheese variants. They usually use a stainless steel wire to cut cheeses in various thickness. Other models already include replacement wires in case your original wire gets broken. Wire cheese slicers usually come with a cutting board, which can also serve as a serving container for your cheese. The board is suited with a wire to allow the slicing process for harder cheese varieties. 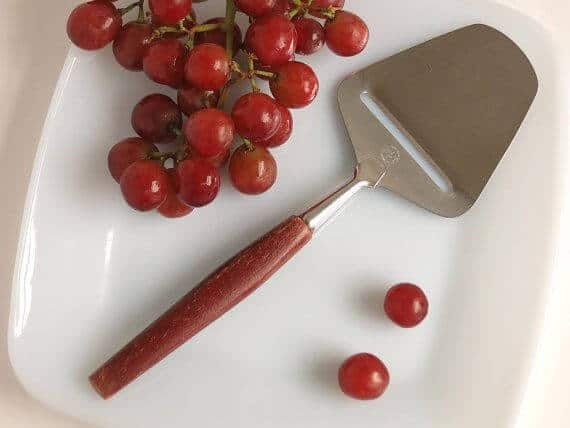 This type of cheese slicer also comes in various forms. Marble cheese slicer- This type of wire cheese slicer has a marble cutting board. The marble brings beauty and functionality to the equipment. With the marble board, you can keep the cheese fresh and helps keep the oil from sticking to the surface. 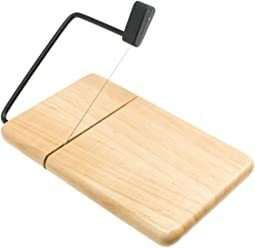 Wooden cheese slicer- This form of wire cheese slicer has a cutting board made of hardwood. The most preferred wood material is beech wood, although any type of hardwood will do. Wood is simple to maintain and lightweight. 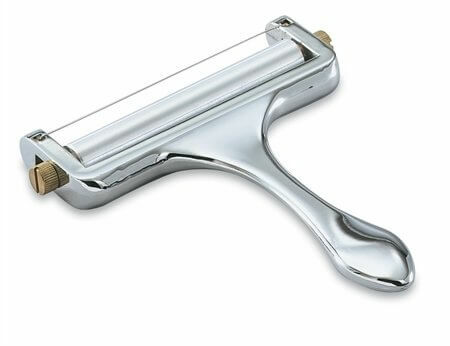 Stainless cheese slicer- This type of slicer offers great durability and safety. You can wash this in the dishwasher because it doesn't crack, rust, or discolor. For maximum convenience, it is best to have a cheese slicer model which will be easy to clean (My friend Robert have an awesome post about keeping your kitchen clean on his blog). The problem with cheese is it tends to stick to the cutting board, wire, or blade. A dishwasher-safe feature is an indicator of an easy cleanup. Above all else, look for a cheese slicer that offers great safety. Among the features that you should keep in mind include a non-slip handle, rubber feet for a non-slip cutting board, and well-secured cutting wires. To save costs from frequent purchases of cheese slicers, always look for a durable model. The cheese slicer should be heavy duty so it can withstand the different levels of pressure. Stainless steel is one material that you should look for since it can withstand rust, corrosion, and discoloration. Zinc alloy is also another material that you should consider as it offers strength, rigidity, and toughness. It is best to have an adjustable wire so you can slice any thickness of cheese you want, from very thin to thick. Only a few models offer this kind of feature, so if you can find one, buy it. As you take control of the thickness you want, it is also nice if you can do it with much ease. To extend the life of your equipment, it is best to look for a long warranty. You can't always tell when your wire wears out. A lifetime warranty is ideal, but one-year warranty can be enough. 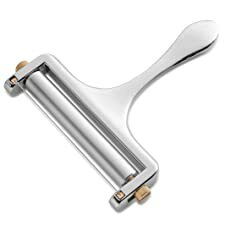 This Bellemain Cheese Slicer is a great rolling cheese cutter which includes a replacement stainless steel cutting wire in case you break the original one. It also offers a one-year warranty for full defect coverage. Made from zinc alloy, this slicer may be one of the strongest in the market. What makes this amazing is its adjustable wire cutter which allows you cut any thickness you want. You can adjust this unit to create very thin slices or chunky slices up to 1/4 inch thick. Unlike regular knives, you don't need to sharpen the cutting wire for longer use. You can clean this in the dishwasher or hand wash it manually. This Sharpcart Cheese Slicer is made of high-quality stainless steel for durability. 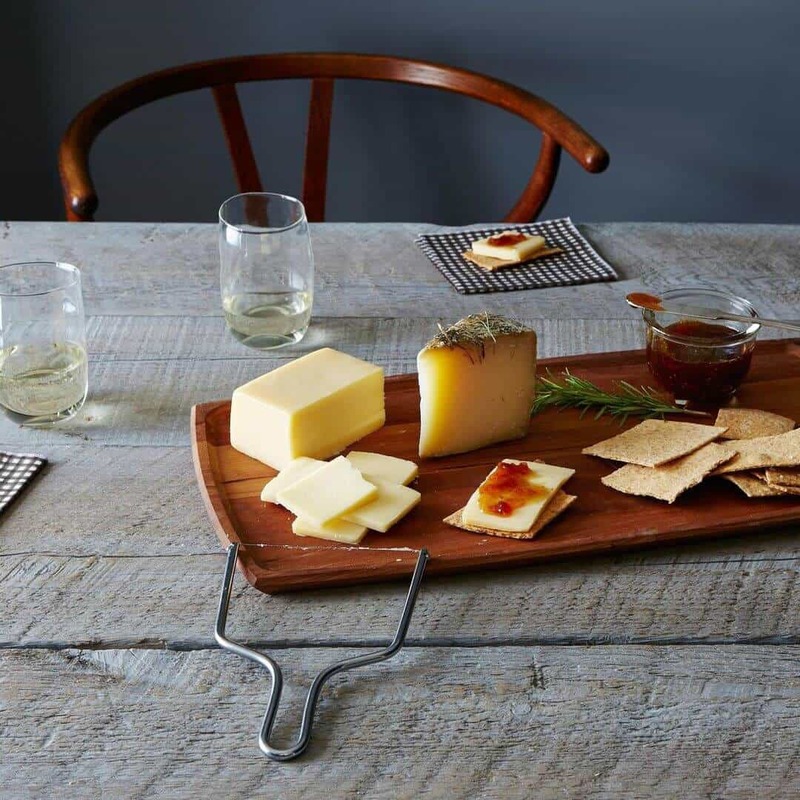 This cheese plane is made with a non-slip handle, making it easy to hold while in use. You can slice soft or hard cheese with this model. The cutting blade is about 1.5 inches wide and it cuts more or less its width. Cleaning is easy since you just have to toss it in the dishwasher. You can ensure its high quality as it offers a 100% money-back guarantee if you're not satisfied with its performance. 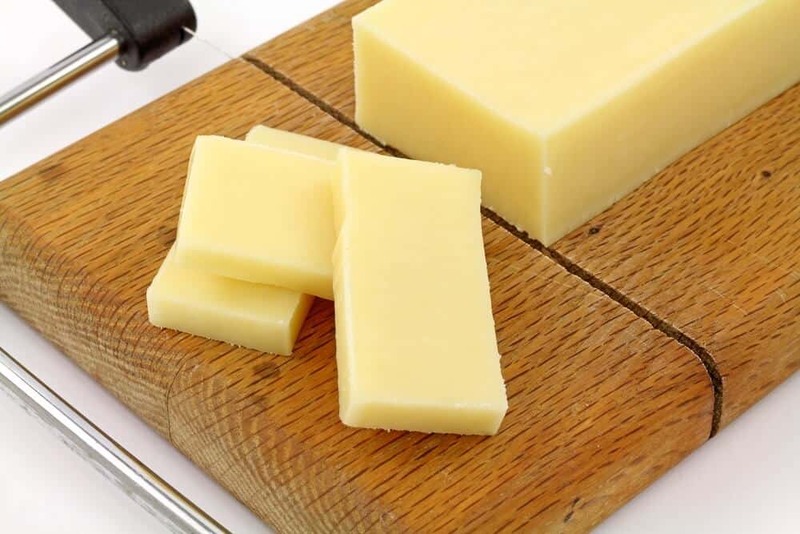 The WalterDrake Cheese Slicer is made with a marble board. Not only does it offers beauty in your kitchen, but it also helps keep an oil-free surface. Eve if you place different cheeses on the board, it won't collect bacteria or leftover tastes. 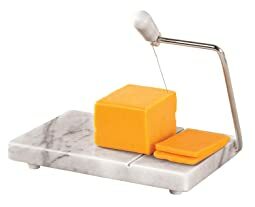 This marble cheese slicer fits a sturdy stainless steel wire to cut cheese up to 2 1/4-inch in width. To protect your ﻿﻿﻿﻿countertop from scratches, four rubber feet are designed at the bottom of the board. It also includes two replacement wires in case you break the first wire. To clean, hand washing is preferred. This Aroma Bakeware Cheese Board Slicer comes with two replacement wires in case you break the first one. 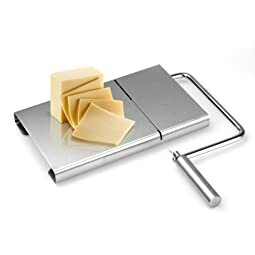 This stainless cheese slicer has rubber feet to keep it from moving when in use. The rubber feet also helps raise the marble base for easy slicing. You can cut hard and soft cheese with this stainless cheese board slicer. It is not advisable to wash this in a dishwasher. Just wipe the board and the cutting wire with a soft damp cloth. 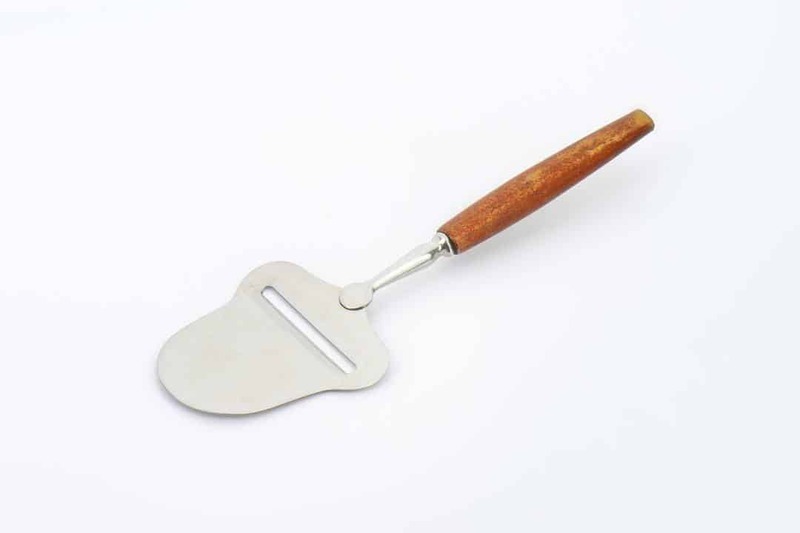 This Prodyne 805B is a wooden cheese slicer that is simple to maintain. Its board is made of beech wood, which is kind of self-healing as it doesn't scar easily. To protect your tabletop from scratches, the board is designed with non-slip rubber feet. The rubber feet also keeps the board secured in place. Its stainless steel cutting wire slices through semi-soft cheese nicely. You can get your broken wires replaced anytime as it is covered by its lifetime warranty. Based on our ratings, the best cheese slicer is the Bellemain Cheese Slicer because it has met almost all of the features that you should look for in a good cheese slicer. More specifically, it's adjustable, durable, has a warranty, and easy to clean. It even includes replacement wires in case you break the original one. If you've bought a cheese slicer already, let us know how the quality is in the comments section. Don't hesitate to share this post if you have enjoyed it. Thanks for your informative review. I’m interested in Bellemain cheese slicer. Do you have any youtube video about that product? Thanks a lot for your response. I don’t currently have a video for the Bellemain Cheese Slicer but I will update you once I do. I am glad if you have enjoyed the review. If you do have a video, please let me know and I’m sure other readers would also love to see it since there are not current available videos on it yet. Thanks again!